With a futile war dragging its feet and so depleting the nation’s reserves as if it were some must-have luxury item that only the best credit rating could afford, we enter economic recession with its benefit cuts, public sector shrinkage and graduate unemployment. From the blue corner the Big Society slugs it out with Broken Britain apparently from the red (sorry but there isn’t a yellow corner anymore) leaving us tired and sceptical of official political visionaries and their well rehearsed sincerity. So what are our country’s artists doing in response? Some of them haven’t changed direction; they are simply doing what they’ve always believed in doing. Their addiction to the confrontational, their anarchic playfulness and sheer bloody-mindedness have now fortuitously come into alignment with our socio-economic predicament. Paul Brandford (born 1965) curator of Enjoy Democracy Responsibly won the Jerwood Drawing Prize in 2003 and was shortlisted for the Threadneedle Prize in 2008. 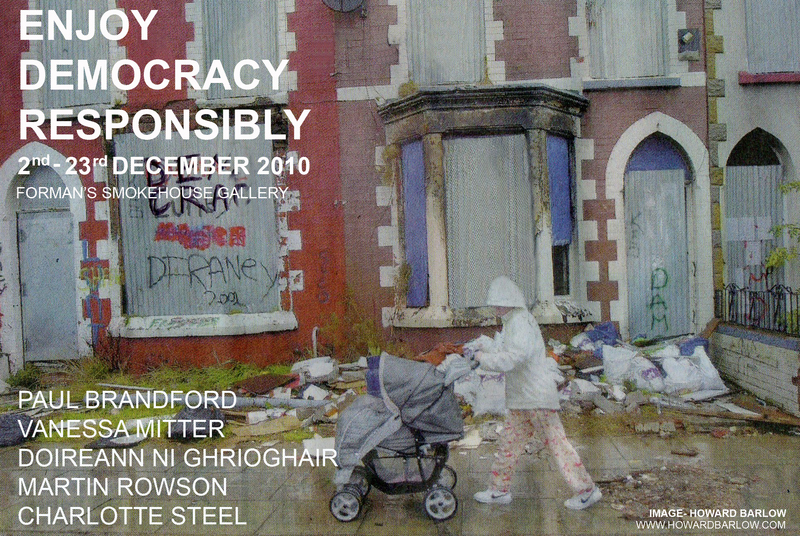 Recent exhibitions include We the People Salute our Glorious Leaders Thus 2009 and Mortars at Dawn 2010 (both with Carter Presents). Much of his work is a kind of anti portraiture which is part caricature, part political and moral critique his playful use of paint subverting the subject’s generally accepted authority. He appears courtesy of Carter Presents. Vanessa Mitter (born 1978) practices painting, drawing and performance. She recently completed her MA at Chelsea. Throughout her work there is an interest in the gestural, the performative and the use of alter egos. Much of her work reappropriates the language(s) of Expressionism. Within her drawing there is a pervasive horror vacui; an obsessive and repetitive mark making which is often reworked in her painting. Doireann Ní Ghrioghair (born 1983) has previously exhibited at Shunt in London Bridge, the Rochelle School and Shoreditch Town Hall. Her sculptures seek to corrupt and suffuse the somberness of male monumental architecture with the frivolousness and flippancy of consumer culture. She wants to disrupt the precision and exactness of this architecture with playfulness and pleasure and to deny these monuments of their heroic autonomy and fixed subjectivity to appropriate them for her own means. Martin Rowson (born1959) is one of this country’s leading cartoonists; his work often appears in The Independent and Guardian newspapers. His work was featured in Rude Britannia at Tate Britain this year. In addition to his political output he has created a graphic version of Laurence Sterne’s Life and Opinions of Tristram Shandy, Gentleman and is currently working on an adaptation of Gulliver’s Travels. Charlotte Steel (born 1965) exhibited in the Jerwood Drawing Prize in 2008 and is a frequent exhibitor both at the Royal Academy Summer Exhibition and the Discerning Eye. As often as her drawings explore dreamlike spiritual visions they reveal dark transgressions within domestic interiors. Working largely in chalk, charcoal or ink she develops a graphic trajectory reminiscent of Goya, van Gogh and Daumier. ~ by smokehousegallery on December 6, 2010.